Girls can ride into adventure with Barbie and her beautiful white horse! Style its beautiful gray mane and tail and put on her bright pink reins and saddle to get her ready for imaginative horseplay. Looking ever so cute, Barbie doll fits on the saddle for a day of riding! She is positively pretty in plaid tunic, tall riding boots and pink helmet. 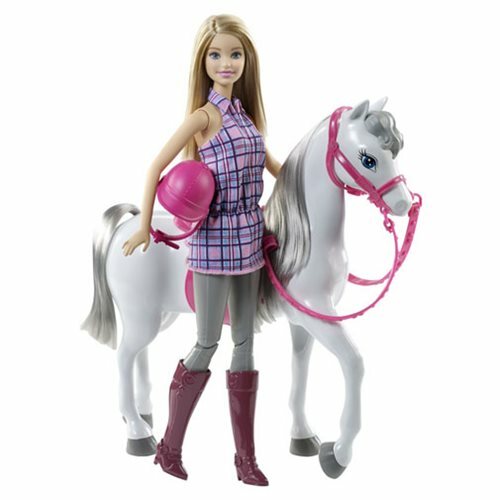 Girls will love playing horseback-riding adventures with this Barbie Horse Doll Set. Includes articulated Barbie doll wearing fashion and accessories and horse with saddle and reins. Doll measures about 11 1/2-inches tall and cannot stand alone. Ages 3 and up.